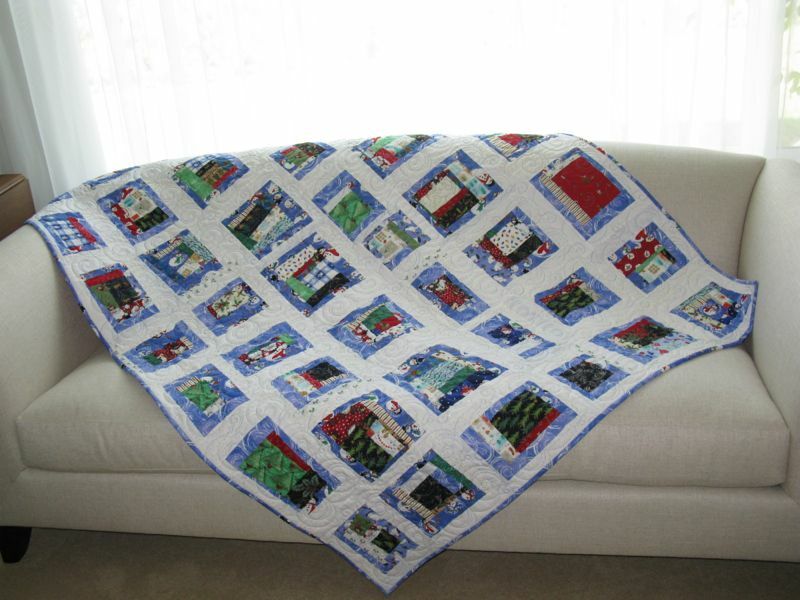 Once There Was A Snowman | OccasionalPiece--Quilt! 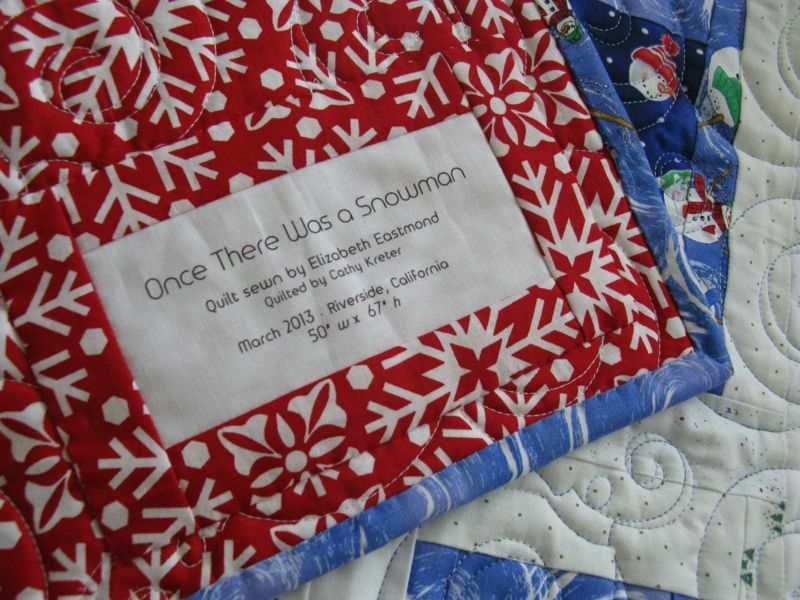 Posted on March 7, 2013 by Elizabeth E.
I’ve had my first finish for March with Once There Was a Snowman. As I’ve mentioned in earlier posts, I’m thinking that I’m several months early with this Christmas quilt, rather than 3 months late. It’s all about context, in my life. This was my attempt at being wonky. Not a favorite thing to do, I must admit. I’ve made quilt blocks that are wonky sewing as well, and really, I just can’t find the attraction in all of this sewing random strips together, trimming at weird angles, sewing some more. I wasn’t attracted to it in the first place, but you really can’t judge a process until you’ve done it. So I did it, and can now safely say: not my favorite, as Johnny Depp said in the movie Chocolate, as he instead preferred other kinds of chocolate. Just like I prefer other kinds of assembling a quilt. But it will be fun to set it out for Christmas and have the house all festive. 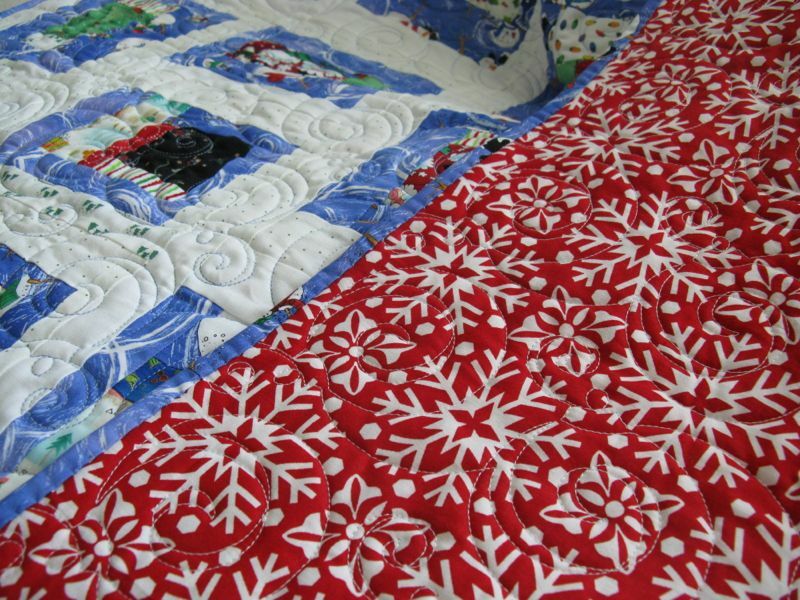 I used a Kate Spain snowflake-on-red fabric for the backing, piecing it carefully to match the design and so no seam would be apparent. My quilter zipped out this very cute ornament design for me. 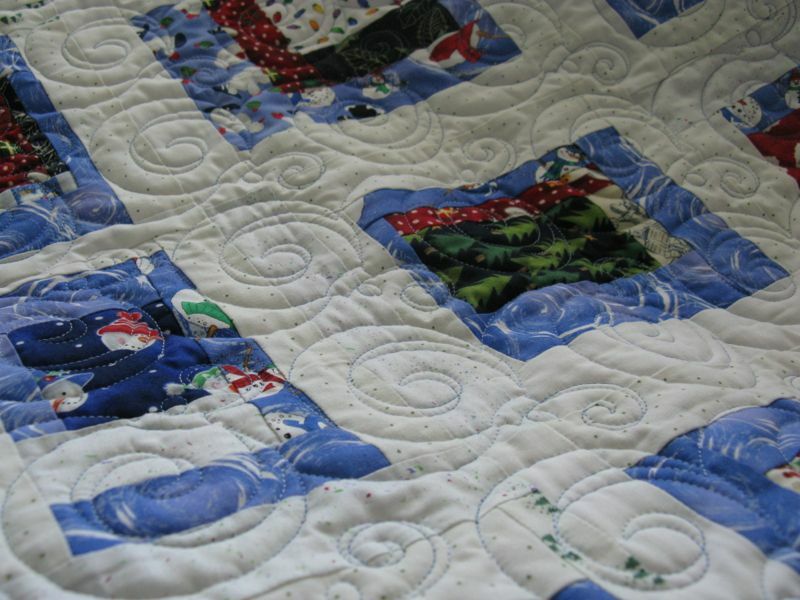 I used Superior’s variegated blue King Tut thread for the quilting. In hindsight, maybe white would have been better on top, but that’s the game in quilting, I think. Always learning, always learning. I have to admit that being a part of the great Finish-A-Long, hosted by Leanne of She Can Quilt really helped motivate me. Now on to the next one! I love it but then I love improv piecing (hate that word wonky). It will be a fun quilt to have for the holidays and congratulations on the finish. I am glad the FAL is helping. I love your quilt Elizabeth! I don’t do ‘wonky’ (or improv!) well either. I put it down to my need for order and structure in my life! But that suits me fine!